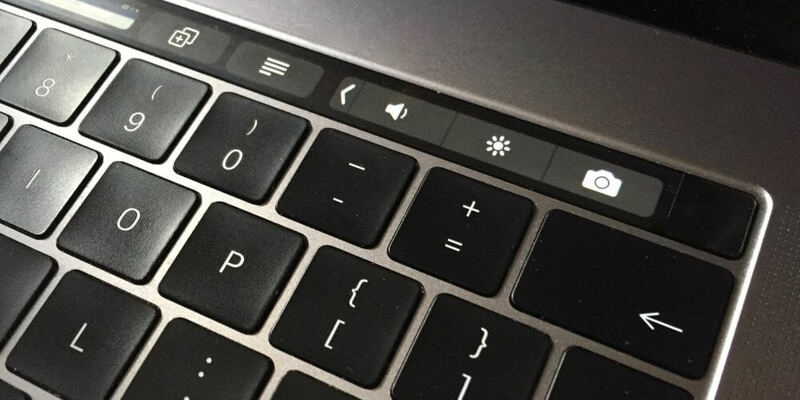 Since 2016, a new feature was added to MacBooks Pro - Touch Bar. It includes sliders and buttons, dynamic touch controls, and other useful functions. Depending on what application you are using, it shows your a relevant set of buttons that you may need. By default, there are three touch bar sections. A virtual Esc key on the left side, control panel on the right side, app-dedicated section in the middle of the touch bar The Esc key can't be changed or removed, still, you can customize two other sections. Not all the applications support this bar, though, developers try to add this special integration. However, those apps that do, allow people to customize their control panel. I mean that you can tweak your touch bar to make it more suitable to your workflow, you have a chance to change and add sliders, buttons, widgets and other features to the bar. Nevertheless, you should keep in mind that not all the touch bars can be customized, so don't become too upset, if yours is so. How to find out if your touch bar is customizable? Launch an app that uses the touch bar, go to the 'View' menu, find the 'Customize Touch bar' line. If it is there, select it and the editing window will appear. For instance, you can see how looks Safari touch bar customization on the screenshot. I click on the item with my mouse and drag it down to add this item to my touch bar. It should be dragged down to the bottom to the bar itself. Use your trackpad to select a perfect position for a new item and release it to place. Launch the customize view once again. Go to the 'View' menu in the app you need, choose the 'Customize Touch bar' line. If you look at them closer, the buttons in the bar shake a bit - it shows us an opportunity of editing them. It looks like a jiggle mode on the iPhone's Home screen. To remove an unnecessary item, move the cursor down into the touch bar, hold down an item and pull it up to remove it. You may also use the touch input. Drag an item to the screen of the touch bar to Trash on the left side. By the way, if you delete something by accident or will need to restore the bar to its default settings, you can always return this configuration. Go to 'Customize Touch bar', search for 'Default' set in the tray. Drag it to the touch bar and replace everything you have customized with the default app's options. This strip is situated on the right in the touch bar. it features the shortcuts that are necessary for the system and don't change when a new app launches. It includes the 'Expand' button, it looks like a triangle of the small size. It can reveal the system controls like brightness, playback, volume and so on. However, you can easily customize this section just like the app's strip. Here is the fastest way of how to add an item to the Control strip/ Run 'System preferences'. Go to 'Keyboard' and choose 'Customize Control strip'. Here, you can add special buttons for Mission control, Spotlight, brightness, play & pause, do not disturb, screenshot, dictation and more. Drag the button down from this screen to the strip of the touch bar with a mouse. The Control strip can consist of 4 items. However, you can modify the Expanded strip as well. Select the arrow to reveal this function while you're in the editing view. You may edit items here independently from the full Control strip. 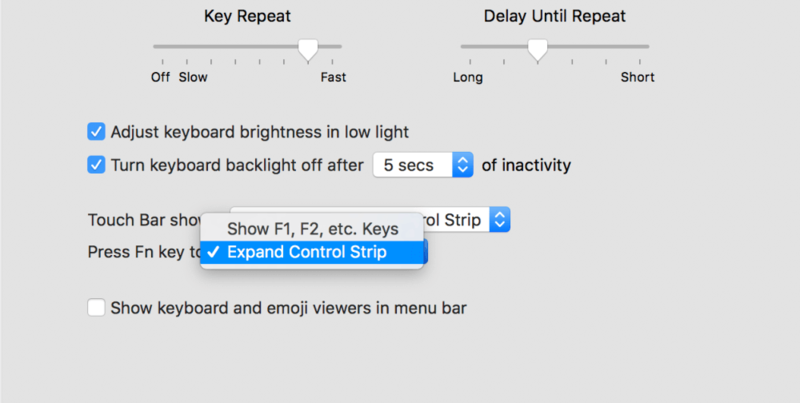 The Control strip of the touch bar includes 4 items by defauls, as I've already mentioned before. It consists of Siri, a volume slider, mute button and a brightness slider. For me, multicolored Siri icon looks odd among monochrome ones. What's more, I rarely use Siri on my MacBook, so this option is just unnecessary to me. The good news is that you can remove this item from your Control strip. Go to the editing mode: visit 'System preferences', 'Keyboard' and 'Customize Control strip'. Move your cursor to the Touch bar view. Navigate your trackpad until the icon of Siri becomes highlighted (or any other button that you need to remove). Click on it to select the item, pull it upwards from the bar to delete it. If you don't need items in the expanded panel, you may delete them too. Choose the expand arrow, and change everything you need. You can modify any button here and remove bright Siri icon from this place as well. If you don't need the Control strip functions, you can remove it leaving all the free space to the App section. This can be comfortable for users who want to take the maximum from every app they work with. Navigate to 'System preferences', go to 'Keyboard' and select the 'Touch bar shows' line. The default setting for this is 'App controls with the Control strip'. It can be changed to just 'App controls'. This will remove the Control strip at all. The Expanded control strip can be removed too, so, it will never show dynamic sliders and buttons from applications. I don't recommend you doing that, however, I'll tell you more about this option. If you need to get rid of it, proceed to my next tip. Apple knows how people are used to the old controls, so they added such an opportunity... You can instantly show the F-keys on your touch bar by pressing the Fn key. You can find it n the left bottom. However, I'd recommend you trying something new, as the touch bar has a greater potential than just showing the row of F-keys. You can choose what will happen to the touch bar after pressing the Fn key in 'System preferences'. For instance, you can tell it to always show the Expanded control strip that was customized by you. 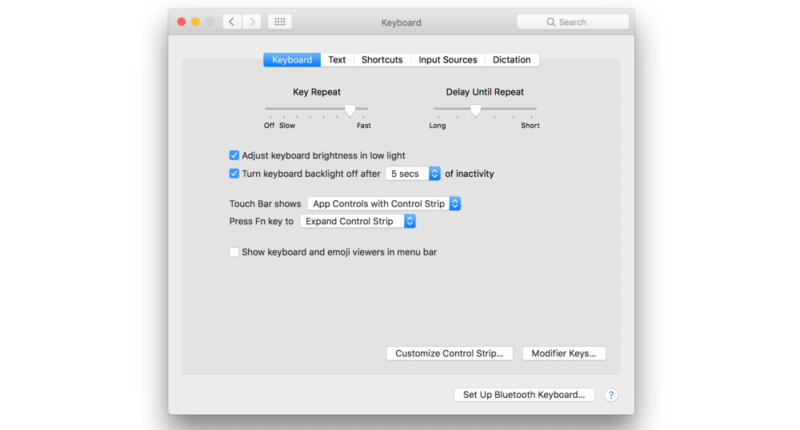 Go to the 'Expand control strip' view in the 'Keyboard' section. Just hit the Fn key and you'll get all the necessary options. For me, it seems more useful to use such an option, but not static buttons. That's all for now, my friends. Do you have some experience with the touch bar? Don't hesitate to tell about in in the comments below. I'd like to read different minds and ideas on this topic and will be glad to discuss it!